Jennifer Lucy Allan goes in search of lost friends and the smooth yacht rock sound at the O2, and finds a big sad hole where her favourite band should be. Originally this article was going to be about how Steely Dan are a guilty pleasure. Not because of how un-cool the smooth yacht rock sound is, how dad rock the whole enterprise is, how Aja is synonymous with gold-plated speaker cable culture, but because of the lyrics. I was going to talk about the squirm I feel around the The Dan’s dark sarcasm and their existence at the height of pervy 70s culture – what’s a dark joke and what isn’t? How do we assess it from here? It was going to mention lyrics that described girls “so fine, so young”, and tracks like 'Hey Nineteen', or 'Everyone’s Gone To The Movies'. But then I listened again to 'Everyone’s Gone To The Movies' and I heard no endorsements in it. I reconsidered, and my hot take cooled. Then on 3 September Walter Becker died, and my hot take was put on ice. And then I went to the show, and it made me feel sad, and I swapped my hot take for a reluctantly delivered melancholic takedown. Let me clarify: I absolutely love The Dan. My dad played Pretzel Logic on cassette in the car, I own it on three formats. The Dan were my unlikely route into Dixieland jazz as a teenager, via the horrible and somewhat inexplicable cover of 'East St. Louis Toodle-Oo' on that record. I once missed a Fushitsusha gig in Tokyo because I was singing 'Peg' in a karaoke booth three times in a row. Becker and Donald Fagen met in college. In the Making Of Aja documentary, one of the talking heads recounts how the pair finished each other’s thoughts and sentences, about how strong (but not infallible) the creative link was between these two men. And here at the O2, supported by The Doobie Brothers (sans Michael McDonald), Fagen appears on stage with his other half missing, not just temporarily this time, and there is something deeply sad about the whole enterprise. Fagen is used to playing without Becker, who had suffered from various health problems related to drug addiction and a spell in a wheelchair after being hit by a taxi while recording Gaucho, but there remains a spiritual hole in this show. It was only the improved sound systems of recent years that had convinced Becker to go back to playing live (of course it was the sound quality), and he reportedly did not like the spotlight, restricting himself to a few choice solos. His absence on the planet is tangible today, even in those few solos (not helped by a dull as dishwater session guitarist). “We are a little different than we were a few months ago,” is Fagen’s only allusion to the cavernous hole in one of the most legendary musical partnerships of the last 50 years. But the show must go on. This feeling, of getting on with it, punctuates the set, a creeping bleakness amplified by underproduction. I wanted to luxuriate in capitalist escapism. To be entertained by its extremities. The O2 is a 20,000 capacity venue with all the bells and whistles consumerism can muster. What’s a more perfect prospect than The Dan at this temple of capitalism? Expensive beer, plastic trees around the inside/outside restaurant periphery, an Aja hoodie for £50, airport security systems and, most importantly, ridiculous capacity for extravagantly produced shows. Pink somersaulted across the whole stadium on a wire. Jay-Z and Kanye emerged on a huge cube on which a shark swam in blindingly bright high-def. Beyonce’s light show was better than new year’s eve fireworks. I want elaborate stage dressing to match The Dan’s lush productions. I want an aesthetic so lavishly imagined every track required a mood board. I want some pyrotechnics. Instead it feels, conceptually speaking, like a rundown house that was once a palatial mansion. A Halloween house party with one badly cut pumpkin on the front step, some pound shop green and black bunting and a packet of Tangfastics. There is not even a banner saying “Steely Dan”. The support, The Doobie Brothers, do have a banner though. Perhaps this aesthetic void is because the show is part of BluesFest, a trilogy of shows that appear to have nothing to do with blues at all (the headliners are Chic, Hall & Oates and The Dan), unless it’s about the blues in terms of being a bit sad, rather than blues as in the genre. 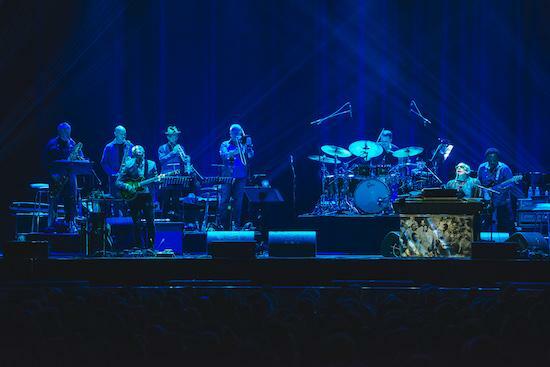 The 69-year-old Donald Fagen is full of energy though, still confidently marching around the stage playing melodica (quite badly), slapping the organ and grinning, and his voice sounds terrific. But he looks colourless, a little unkempt, his tie loosened and flapping on an office-carpet blue shirt. He introduces the band as “the Steely Dan organisation”, and while for any other band this would seem absurd, for The Dan it actually holds. Becker and Fagen always used session players, the best they could find, to realise the Steely Dan sound. However, this lot are not in the Bernard Purdie league of session players. Becker’s replacement, a smartly suited session guitarist called Jon Herington, calls to mind The Onion’s Area Man. A headline bounces around my head every time he solos: “Area man ends up playing lead guitar for Steely Dan”. In fact, none of these session players really feel like they’re hitting the mark. They are all, of course, completely competent, and are playing extremely well, but it’s stiff, rigid, soulless. The drummer is obviously excellent, but it feels like a perfect run-through on Drum Hero – completely immaculate, top score mate, but completely lacking in feeling. The Jools Holland-style backing singers are, crucially, not Michael McDonald, and are of the Joss Stone/Hootenanny variety. While they are terrific singers, this is not a good fit. The exception is bass player Freddie Washington, who has a warmth to his playing that sticks out a mile against the emotionless backdrop of his bandmates. They play lots of the hits – 'Peg', 'Babylon Sisters', 'Aja', 'Black Cow', 'Reeling In The Years' as an encore – but even a 90-minute show (which Fagen complains is too short) can barely touch everything you’d want to hear from the back catalogue. Singing along to 'Peg' becomes an internal battle against the inescapable feeling of being catastrophically underwhelmed by a band who are supposed to be overwhelming in their lushness. I am pained and reluctant to admit that the whole project sounds like a Steely Dan covers band fronted by Donald Fagen, and feel crushed committing this thought to paper. But the writing is on the wall, and there is certainly space for it, in huge metaphorical letters on the huge blank space behind them, on which I keep imagining Walter’s face. It is too easy to say that what’s missing is Walter, as he wouldn’t have been doing an awful lot anyway, but as a spiritual presence, as the other half, there is an elephantine melancholy in the room knowing he’s not around at all. I can’t tell if it’s me being sentimental, if Fagen is playing joyfully in tribute and celebration, or if he is pushing against the loss of one half of a very deep partnership and long friendship. Someone from the American DIY scene once told me a story about trying to bootleg some Steely Dan live shows, and getting instantly shut down. I wasn’t sure if I would have wanted them – a large part of the pleasure of The Dan is the attention to detail, the productions that glide so wonderfully, so expensively, that embarrass your stereo and demand to be listened to in a showroom. Tonight confirms those reservations. How can a studio band – arguably the studio band – exist on stage with the same qualities, the same feeling, as their records? How can finicky and immaculate productions be converted for a venue like the O2? The short answer is: they can’t. The creeping bleakness only grows after the show, like that scene at the end of the recent Twin Peaks where Cooper pulls into a grotty diner after passing over into the ‘real world’, and all the slickness and precision of Lynch’s interior sets lifts, leaving grim, stark reality with all its dirt, its ugliness, its imperfections. I still love Steely Dan, but I love Steely Dan on record, where they remain untouchable, contained and perfect, where Walter and Donald are always on the buttons and session players are in the studio recording their takes into infinity. I love Steely Dan, I really do, but I do not love Steely Dan live.